Meteors appear each night when the earth sweeps up material as it orbits. The material causing these random meteors comes from debris in the solar system. This debris might come from asteroids, comets, planets or the remains of material that formed the planets in the early solar system. It would be typical to see a few such meteors each hour under dark sky conditions. Meteor showers arise when the orbit of the earth intersects the orbit of material boiled off a comet when near the sun. Since orbits are like clockwork (or perhaps calendarwork?) this intersection occurs at the same time each year, leading to an annual meteor shower. All of the meteors in a shower can be traced back to a single point of the sky. This point is called the radiant and is the point of orbital intersection. A given meteor shower is named for the constellation in which the radiant lies. One of the most consistent of such showers is the Perseids in August. Just after midnight on August 13, 2010 we finished a research data run (see research description) and pointed the telescope near the zenith with the drive motor off. 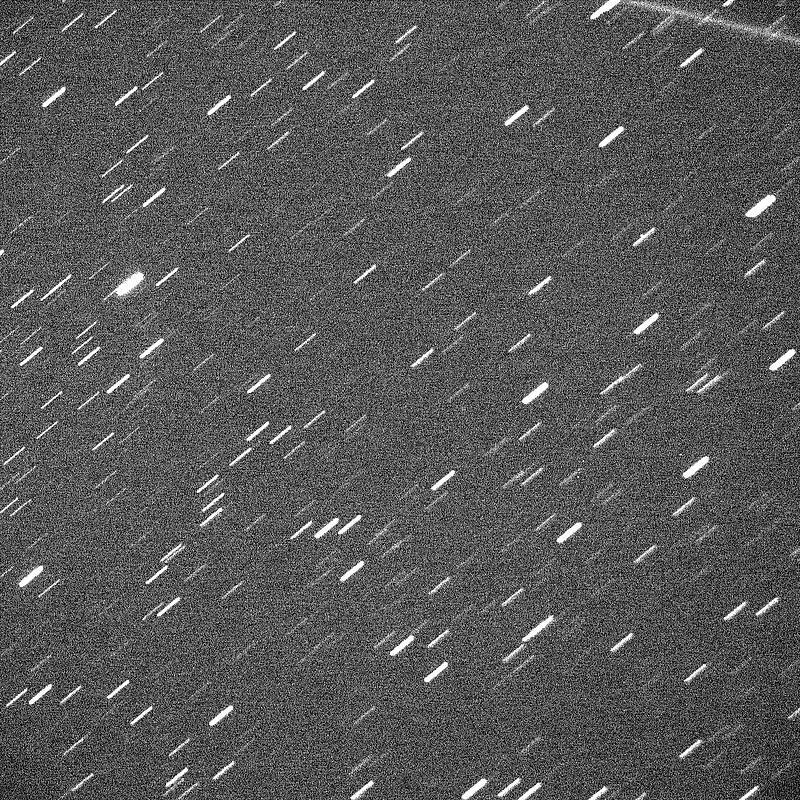 We shot 450 5-second images in the hopes that a faint meteor or two might appear but w/o great confidence since the field of view is small, less than half a degree square. Such a small field means that any given meteor is very unlikely to pass through where we are looking. However, the 31st image showed a track that is consistent with a meteor. It makes an angle with the star tracks that would be appropriate for a Perseid and the track is wider than we see for, say, a satellite. Somewhat surprised by this track we will conduct a more careful search for fainter tracks in the images. A likely Perseid meteor track.